While brides and grooms are clearly the centerpiece of any wedding and of the wedding photography itself, sometimes it’s the kids at weddings who have the most gleeful fun (and who occasionally steal the show). 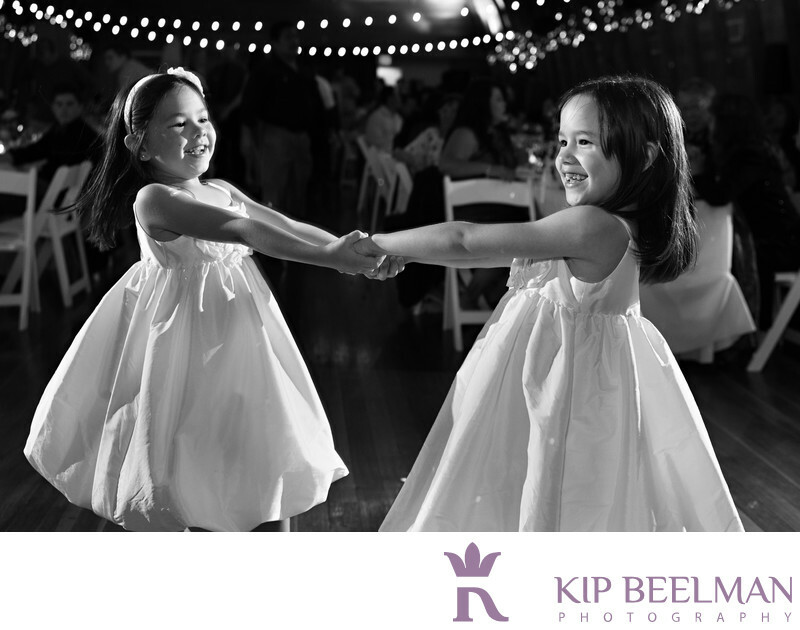 These two beautiful little girls absolutely owned the dance floor that night and their faces show how much fun this Bothell, Washington wedding was from start to finish. The day began calm and relaxed as the couple took in the alluring surrounding scenery for portraits. Their smiles rivaled those of these two charmers. In addition to this delightful, twirling fun on the dance floor and the main occasion of the wedding, the other highlight of the day was the incredible, mouth-watering food, prepared by Russell Lowell, one of Seattle’s most sought-after chefs and owner of Russell’s Restaurant and Russell Lowell Catering. The Loft at Russell’s has beautiful cathedral ceilings, clear grain cedar wallboards and refinished original fir floor of a 1927 barn, making it ideal for weddings, receptions and memorable wedding photography. The lights twinkled, the music played and the guests had a ball. The focus for the reception food is on “Simple. Well done” and everything was simply perfect. Likewise, Russell Lowell Catering creates food that people are destined to remember – it is designed to please the eye and please the palate, focusing on seasonal pairings and fresh, local ingredients. From moment to moment, photo to photo, and bite to bite, this wedding satisfied the senses and the soul – and included some fantastic dancing from two very, very talented twirlers. Location: 3305 Monte Villa Pkwy, Bothell, WA 98021. Keywords: Bothell (3), Hall Wedding (21), The Loft at Russell's (3).